The ultimate plant-based Indian cookbook by the creator of VeganRicha.com. 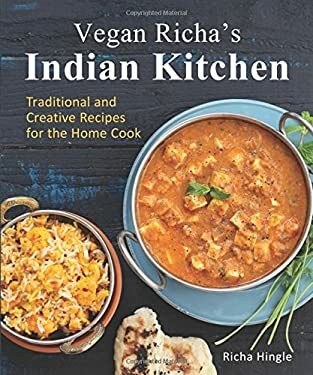 From delicious dals to rich curries, flat breads, savory breakfasts, snacks, and much more, this vegan cookbook brings you Richa Hingle's collection of plant-based Indian recipes inspired by regional cuisines, Indian culture, local foods, and proven methods. Whether you want to enjoy Indian cooking, try some new spices, or add more protein to your meals using legumes and lentils, this book has got it covered. You'll explore some well-known and new Indian flavor profiles that are easy to make in your own kitchen. Learn the secrets of eclectic Indian taste and textures, and discover meals in which pulses and vegetables are the stars of the dish. And once you taste Richa's mouth-watering desserts, they will likely become your new favorites. Within these pages you will find recipes to please all the senses, including: * Mango Curry Tofu * Whole Roasted Cauliflower in Makhani Gravy * Baked Lentil Kachori Pastries * Quick Tamarind-Date Chutney * Avocado Naan * Fudgy Cardamom Squares The recipes have been designed to simplify complex vegan cooking procedures, and Richa's workflow tips incorporate modern appliances and techniques from other cuisines to reduce cooking times. Replacement spices are indicated wherever possible, and Richa also provides alternatives and variations that allow people to be playful and creative with the Indian spices called for in the recipes. The restaurant-quality vegan recipes are ideal to make for yourself, for family, and for entertaining guests. New (53 available) BRAND NEW. Over 1.5 million happy customers. 100% money-back guarantee. Make your purchase count: support Better World Books' worldwide literacy partners.